Imagine you’re sitting in your local café and the person beside you takes out an e-cigarette. Chances are, the liquid they’re “vaping” has nicotine in it, and when they puff on the device, a little stream of vapour comes out. While this scenario might not be happening in every corner café, there’s currently little in the way of e-cigarette regulation in Canada, so there’s nothing to stop people from “lighting up” wherever they want. Several interest groups in Canada have been pushing for the regulation of e-cigarettes, but there is still no legislation that governs the sale of e-cigarette devices or liquids used in the devices. Since the first e-cigarette products appeared in Canada less than a decade ago, Health Canada has issued one statement on the subject—and that was in 2009. The statement says that importing, marketing and advertising e-cigarettes, liquids and related products is not allowed without approval from Health Canada, primarily because these products need to be evaluated for safety and health claims (e.g. as an aide to stop smoking regular cigarettes). This hasn’t stopped companies from entering the market though. 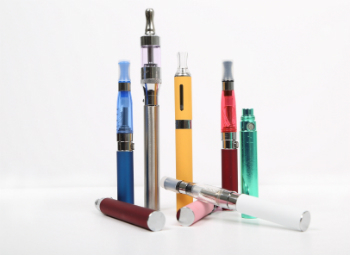 E-cigarettes are widely available online, and retail locations are opening up in many cities. Since the products are relatively new to Canada, governments at all levels still need to address the sale and use of the products, whether it’s approving the ingredients in e-liquids, developing by-laws to prohibit the use of e-cigarettes in public places, or banning the marketing and sale of the products to minors.